Since January I’ve been recording a new CD. I started out with the piano tracks at home and am now set up at “Studio Chalet”, which, in reality, is a beautiful little cottage on the river where I am cozily installed with my recording gear, nifty Jotul wood stove to keep me warm, high ceilings and big windows looking onto the river flowing through the pines. 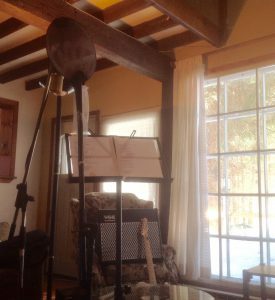 There is nobody around to disturb so I had the opportunity to record all my electric guitar tracks on 11….oh yeah!! All the drum tracks were done by my buddy, drummer extraordinaire, David Devine. Jean Francois Martel, on bass, has really caught the funk bug since spending so much time playing in Cuba! This week, although I wanted to finish the remaining master vocals, they’ll have to wait until I recover from this croaky-throat cold. Coming next will be Jim Zeller on harmonicas and Saxophones by Dan Martel. Eli’s guitars and Hannah’s vocals will have to wait until they finish school around the end of April. It’s so exciting, can’t wait for it to be completed but, right now, I’m enjoying the process. Thank you Danielle and Guy for making this space available! Will keep you posted.